You might not think that an iPhone app exploring social policy would really take off. I mean, there are Wallace and Gromit comics to compete with on the app store. 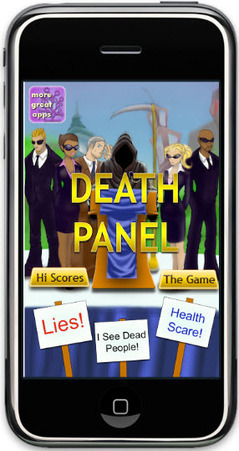 But actually a gaming app based on the current debate over the US health care system has been a surprise success. But it’s exactly because it taps into a controversial issue that the app – Death Panel – has been picked up by the press big time. This is an iPhone app going where most apps don’t. With the name Death Panel you’d think it’s anti-Obama and pro-Palin but apparently it takes a balanced look at the issues. It’s not just a joke either, there’s a whole movement called Serious Gaming which advocates using gaming technology to look at real-world issues. Death Panel puts a user in the role of a local politician who has to build a strong constituency. The user must stand on a virtual platform and answer questions correctly about the healthcare reform issue. The game has an integrated location-based feature where players can look up info on real-life politicians in their region. We decided Britain’s social issues could do with serious gaming solutions too, so we worked out five issues of public concern that would almost definitely benefit from app games.